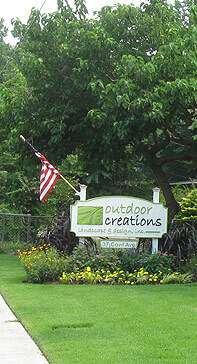 Outdoor Creations Landscape & Design, Inc. specializes in guaranteed landscaping and lawn care solutions to enhance the value and natural beauty of your home. A beautifully landscaped yard is an investment that pays for itself in pleasure as well as increased home value. We are a locally owned and operated business serving Wilmington, NC and the surrounding areas of New Hanover, Brunswick, and Pender Counties. With over 25 years of experience and knowledge in the field, we are able to provide all facets of landscape services to ensure you only have to deal with one company for your many landscape needs. We work one on one with each homeowner to design landscape and lawn care programs that are specific to their individual needs or desires. The staff at Outdoor Creations Landscape & Design, Inc. keeps current on chemical applications and other certifications by attending all required courses throughout the year so you can be assured you’re always dealing with a knowledgeable, well-educated team of professionals. If you’re interested in working with a professional, honest, high-quality landscape company who will care for your property as they would their own, why not give Outdoor Creations Landscape & Design a call?